Chief Minister Smt. 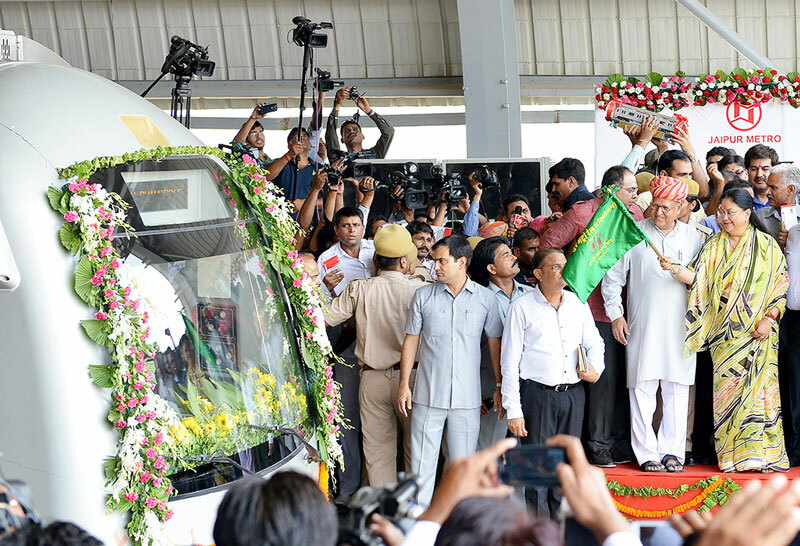 Vasundhara Raje on Wednesday dedicated the Jaipur Metro to the people of Pink City. Inaugurating the Phase-1-A of Jaipur Metro Smt. Raje flagged off the Metro train from Mansarovar station. Smt. Raje travelled in Metro from Mansarovar to Chandpole station and from Chandpole to Civil Lines in return journey. Members of the Council of Ministers, MPs, MLAs and other public representatives also travelled in Metro. She further said our effort is to make Jaipur Metro economically viable so that government does not have to give subsidy. Effort will be made to complete the next phases of Metro also, she said. Smt. Raje said Metro shall be economically viable when the remaining phases will be completed. She said Jaipur is a historical and tourism city. The structure of Metro should have been constructed so that they could have enhanced the beauty of this city but unfortunately it did not happen. Now the government will try to complete which is lacking. Women standing on the roofs and children welcomed Smt. Raje while she was travelling in the Metro. The Chief Minister also reciprocated by waving hands towards the public. Smt. Raje went to the ticket window at Mansarovar station, took smart card and then travelled in Metro. She also tried to know about the process of issuing of ticket from ticket vending machine. The Chief Minister visited operation control centre, police control room, depot control and workshop and took stock of the technical working system of Metro at Mansarovar station. CMD of JMRC Shri N C Goyal informed the Chief Minister about the operation, power supply, disaster management, rolling stock and security measures. The Chief Minister met train operators, women maintenance staff and other technical staff, talked to them and applauded their efforts. Smt. Raje was given warm welcome at Mansarovar and Civil Lines stations.